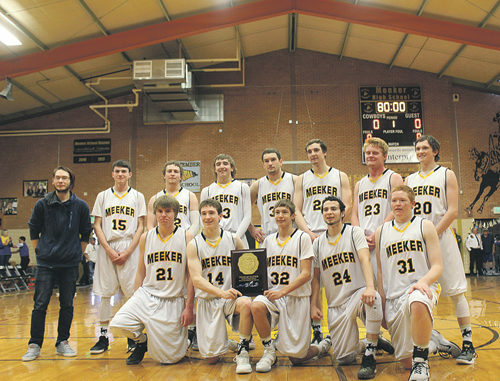 MEEKER | March Madness for the Meeker Cowboys boys’ basketball team tips off tonight at 8:30 p.m., when the Region 5 champion Meeker Cowboys will play the Region 3 champion Highland Huskies (20-3) in the Budweiser Event Center in Loveland. For a fifth time in his 20-year coaching career in Meeker, Klark Kindler has coached a regional championship team, qualifying his team for the 2018 2A Colorado State Basketball Championships. As Western Slope District champions, the Cowboys used their home court advantage in the Region 5 tournament they hosted and won by beating the Telluride Miners 73-42 in the first round, then defeated the Simla Cubs 56-46 in the championship game in front of a full gymnasium. Meeker’s big men, Zach Dinwiddie and Eli Newman, led the Cowboys with 22 and 19 points respectively and senior classmate Logan Hughes had 10 assists and nine points of his own against the Miners. The Cowboys led 46-22 at half time and extended their lead by 10 more in the third quarter. Brennan Jensen finished the game with seven points against the Miners, senior Doak Mantle added six, freshman Ryan Phelan made both of his free throws, while junior Kale Burke and senior Trapper Merrifield both scored two. The Cowboys used their experience to beat a younger Simla team, playing the Cubs close in the first quarter then expanding their lead in the second. The Cowboys led 12-9 after the first quarter and 29-20 at half. The Cowboys took a 10-point lead into the final period and finished the game with the same margin. Mantle led the Cowboys with 15 points, including shooting six-for-six from the free-throw line, while Dinwiddie and Hughes each scored nine, Newman finished with seven, Stephen Walsh and Jensen each added five, while Phelan scored four and senior Valentin Rosas made a basket in the championship game. Win or lose at state, the Cowboys will play a game Thursday, Friday and Saturday. A win Thursday guarantees Meeker a top-four finish. The Cowboys are on the same side of the bracket as No. 1 seeded Crowley County and No. 8 seed Sanford. Byers (No. 3) will play Ignacio (No. 6) on the bottom side of the bracket, along with No. 2 Yuma and No. 7 Ellicott.